The UAE-India relationship has entered a vibrant growth phase with bilateral trade on track to exceed $100 billion by 2020, key speakers at the '2018 Dubai Global Convention' said on Tuesday. "India is an important demographic and economic powerhouse in Asia and investments between the 2 countries exceed billions. 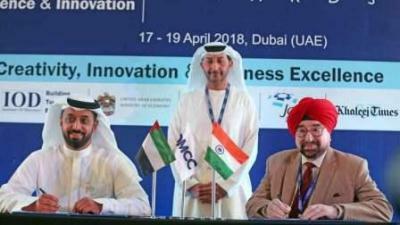 This convention will take the India-UAE relationship a step further as both countries explore ways to enhance business ties, intensify economic cooperation and increase innovation and entrepreneurship in sectors of mutual interest," Abdulla Al Saleh, Undersecretary, Foreign Trade & Industry, Ministry of Economy, said in his inaugural address. "India is the first trading partner for the UAE. In 2017, trade relations between the UAE and India reached $53 billion, of which $35 billion is non-oil trade. The UAE is the third largest foreign trade partner to India after China and USA," said Al Saleh. He said the UAE invested over $5 billion in India through foreign direct investment stock until the end of 2017, which makes the UAE one of the top investors in India. Additionally, India is the second largest direct investor in the UAE at the end of 2016 with $6.6 billion. "In the beginning, foreign trade and oil and gas were the focal point of the India-UAE relationship. But today, this has diversified to include many new sectors following the recent high-level visits of UAE and Indian leaders," Al Saleh said. The convention, organised by The Institute of Directors (IOD), in association with Khaleej Times, lined up some leading business and thought leaders, who shared their insights and explored how best to remain relevant and competitive, stimulate innovation and achieve the corporate responses that are required in the age of disruption. This year's main theme is 'Transformative leadership for fostering creativity, innovation & business excellence'. Sheikh Nahyan bin Mubarak Al Nahyan, Minister of Tolerance, inaugurated the convention and presented the 'Golden Peacock Awards' to top corporate leaders for Business Excellence and Innovative Product/Service. Ashok Chawla, chairman, National Stock Exchange of India; and Navdeep Singh Suri, Ambassador of India to the UAE; addressed the opening session. Ahmed Sultan bin Sulayem, executive chairman, Dubai Multi Commodities Centre (DMCC), delivered the keynote address. Abdulla bin Damithan, chief commercial officer, DP World, also delivered a special address. Some of the leaders who spoke also include Shishir Kapadia, senior vice-president, finance and operations, Khaleej Times; Prof. Colin Coulson-Thomas, president, Institute of Management Services, UK; Mohanned K. Al Anni, vice-chairperson, Gulf University, Bahrain; Khurram Shroff, chairman, International Blockchain Capital, IBC Group; Vipul, Consul-General of India in Dubai; and Hind Al Youha, director - investment department, UAE Ministry of Economy. Kapadia spoke on the topic of 'Leadership for integrating excellence, culture and innovation for social value'. He said: "Khaleej Times is committed to lead the change" and would remain transformative by leveraging innovation to drive excellence. Speakers at the session discussed adaptive leadership for promoting strategic disruptive innovation. The inaugural session also witnessed the signing of an MoU between IOD, India, and DMCC in further strengthening support between the 2 institutions. "We aspire to reach the ratio of three per 100,000 people in 2021," added Sheikh Saif. Dr Tayeb Kamali, chairman, IOD India, UAE chapter, director-general, education and training development, Ministry of Interior, the UAE, is chairman of the convention, which drew over 450 business and corporate leaders.